one of America’s top three favorite cocktails. Despite those ubiquitous Martinis and Cosmos, Bloody Marys remain among the country’s most popular cocktails. Depending on the market, Mary is the number one, two or three best-seller at restaurants and bars, and generally the most commonly served cocktail at home. And it’s a healthy drink—at least, it is when you use a good mixer that doesn’t add sweeteners other than those in the Worcestershire Sauce. Just for starters, there are antioxidant lycopenes in the tomato juice,* antioxidants in the citrus juice (vitamin C and others) and a mild antibiotic benefit from the horseradish. An ocean’s worth of Bloody Mary mix is sold each year. Even bars buy mixers rather than take the time to make their own. *Lycopene may prevent prostate cancer and some other forms of cancer, heart disease and other serious diseases. While we do mix our own, seeking out the best tomato juices, we also keep tabs on the best Bloody Mary mixers. Recently, we tried three from Demitri’s: Classic, Extra Horseradish and Chilies & Peppers. Demitri Pallis was a frustrated bartender who noted that, “from bartender to bartender, day to day, a customer couldn’t count on a consistent and delicious Bloody Mary.” He developed his mixers for bars; now you can buy them, too. 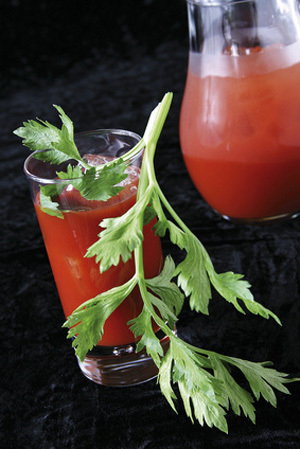 Add two ounces of Demitri’s seasoning to one quart of tomato juice, mix with vodka and toast to the holidays. Read the full review.